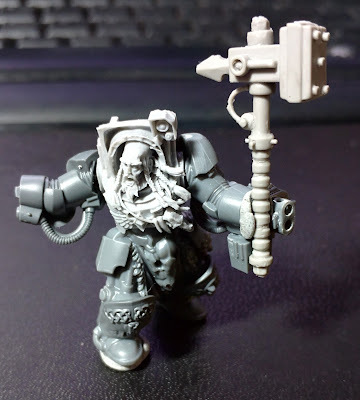 Back to Arjac, I have been neglecting his completion over the past few days, mainly as I have been trawling for the correct hammer that would fit the aesthetic of Arjac. I ended up scrounging around and came up with the following alternatives. Again maxmini were on hand, I had a blister laying around from an abandoned Salamanders foray I ended up shelving. I also had a WFB Dwarf Great Hammer Head, and a resin off-cut. Attaching these alternates to my Arjac mock up. I have the following options and how they could look. According to the fluff Arjac's was known to be immense, even for a Marine and a Space Wolf. 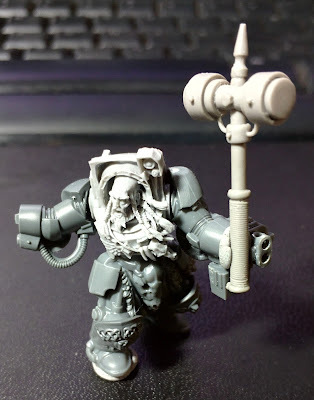 His weapon, Foehammer had in-built arcane technology allowing in to teleport and quickly return to his hand. 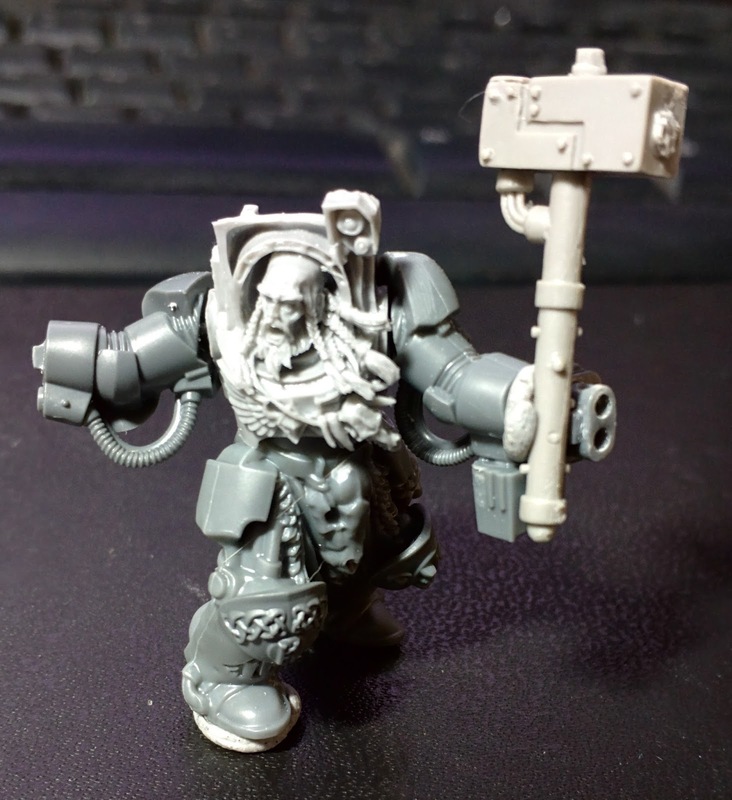 Given this, I felt that the first hammer had a very heavy Mechanicum ﻿feel, and less so a master crafted ornate Space wolf device with a teleporter inside. 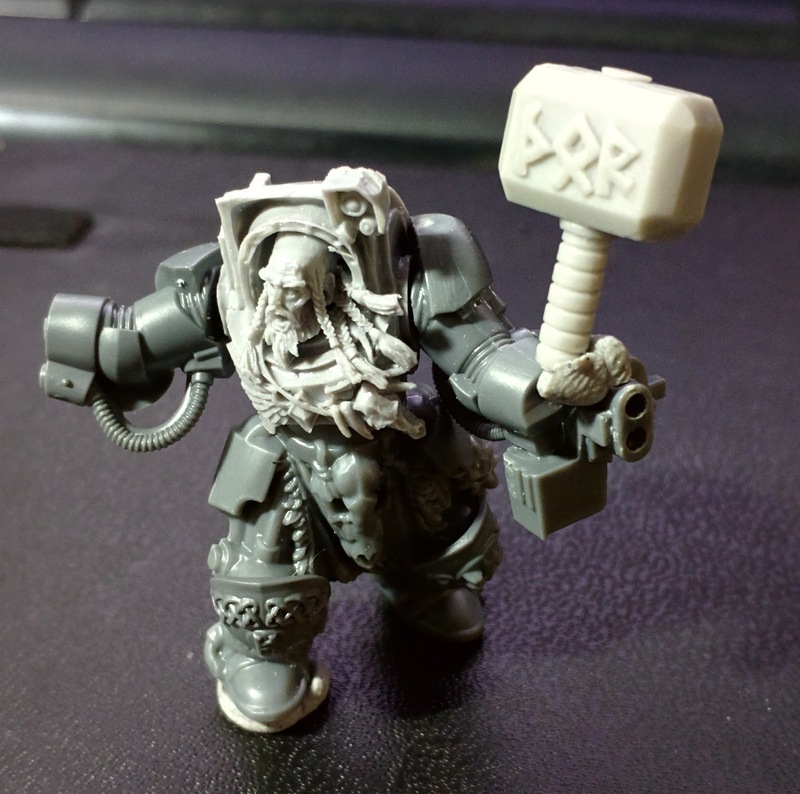 The third option was from a WFB Dwarf Great Hammerer. It did fit the aesthetic with the embellishments, but just didn't feel impressive ﻿enough, i.e. needs to eat a couple more steak dinners. Next is a off cut of resin left over from a captaincalico Primarch proxy miniature. Might I say, captaincalico makes some very nice high quality sculpts, but they are more likely to be Primarch or one off display miniatures, the true scale being larger than a heroic 28mm miniature. 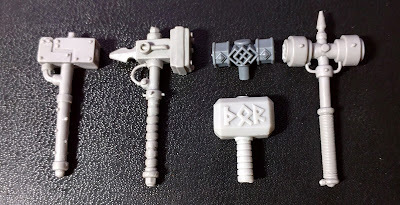 The aesthetic is perfect, a definite Mjolnir derivative, but I am just not feeling it, for this mini, with respect to the current handle. Unfortunately the runes are only carved on one side of the hammer head. Maybe I should cut the handle, add a few power cables and green stuff some runes to the other side. 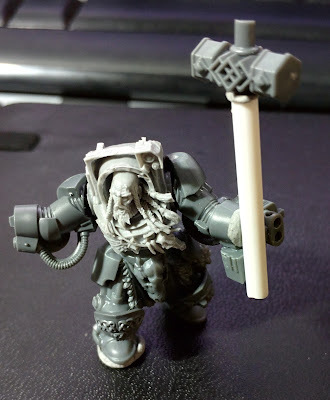 The final hammer actually looks like it could be the business. The rounded aesthetic reminds me of pressure vessels that are used to store gas or liquid under pressure, which fits with the idea of containing alien technology. The only thing is it is the least amount of artifice. Thinking out loud, maybe if I cut the spiked tip off add a few wolf skulls to the sides, we could have a winner.